Well, somebody is excited about the Lunar New Year! Burly, pig-like brutes who favored axes and other primitive weapons, Gamorreans were often used as muscle by Hutts and other underworld kingpins. Jabba the Hutt employed a gang of intimidating Gamorreans to guard his palace on Tatooine. The Star Wars Black Series has been around long enough now that it's probably pretty safe to call it a success. Yes, the line had some problems with distribution at the beginning, but they've mostly fixed that now. It's not like we're talking about Mattel's DC figures here, which never get into stores at all at all at all. Anyway, Hasbro is now introducing Black Series XL, which will allow them to sell bigger, more complex figures - the first official release in that line will be General Grievous, but they've already been playing with the format with a couple of Target exclusives, including the Gamorrean Guard. 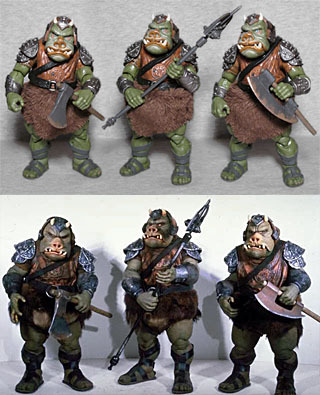 Ralph McQuarrie's first designs for Jabba's palace guards looked like something out of He-Man: it was a green gorilla-man wearing shiny armor. 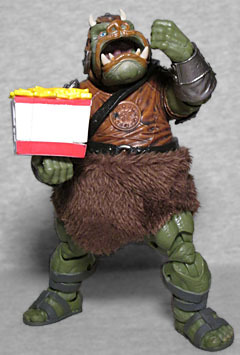 Seriously, you throw a Horde symbol on that, and you'd have no trouble believing it was just another unproduced figure. Anyway, it was Joe Johnston who turned them into pigs, and that's how the world came to know them. Johnston's original design would have seen the Gamorreans mostly unclothed, with a little bit of metal plate for protection. That never would have worked with the technology available in the '80s, so the final costume included a baggy shirt, a fur skirt, and armored epaulets that were added mainly to hide the seams where the arms were attached to the body. The eyes are a little bit too far apart - they're spaced the way they would be on an actual creature like this, when they should be spaced like a human's (since they were simply human eyes peeking out through a mask). The clothing and skin are sculpted with different textures, and the metal is its own thing as well. The softgood fur doesn't look especially realistic, but we're not going to judge the toy too harshly for that. We'll just point out that sculpting it is generally better, until you get up to about a 12" figure. 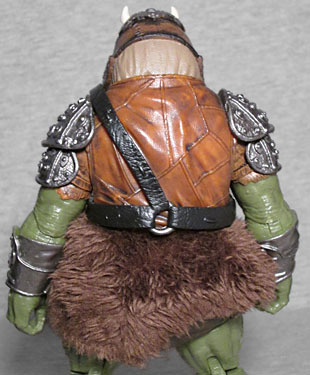 His belt-thing is a separate piece, as are the top layers of the epaulets; the lower layers and his bracers are sculpted on. The Guard has the kind of articulation you would expect from the Black Series: swivel/hinge ankles, double knees, swivel thighs, balljointed hips, a balljointed waist, swivel/hinge wrists and elbows and shoulders, and a head that's presumably a swivel/hinge, though the "swivel" part does not work as well as the "hinge." Also, his mouth opens! And unlike Ackbar, his isn't a cheat: the jaw is attached to the head, and opens and closes regardless of what position his cranium is in. His "underwear" is a little baggy, hanging down lower than the pelvis, so the hip joints sit higher than they appear at first glance. To help justify the larger packaging, the figure includes three weapons: two axes and a staff. Those aren't the only weapons they're seen using in the film, but they are the three seen in a promotional shot from the Behind the Magic CD-ROM, which assuredly influenced their inclusion here. The blades on the axes look rusty (or bloody), because of course the dimwits wouldn't take care of their gear, and the staff is perfect for blocking the path of any mysterious Jedi who might casually wander into the palace and start heroically Force-choking piggies left and right. Honestly, there's not a lot here to justify the "XL" style packaging. 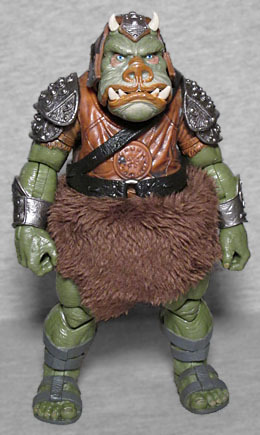 The Gamorrean Guard is a good toy (and that articulated mouth is surely going to have a lot of fun playing with my miWorld sets), but he feels like he could have been squeezed into a normal box if they really wanted to. But hey, if you're a truly enterprising costomizer, you could create the world's first 6" scale Robin Hood: Prince of Thieves Friar Tuck figure!